Natalie* is an Army Veteran who works full time while raising her two small children on her own. While it seemed everything was going well, she received a notice from her landlord that she had to vacate the property in 30 days because he decided to sell the house she was renting. She began trying to find an apartment but was having a hard time and was terrified she would end up on the streets. When Natalie called 2-1-1, the 2-1-1 Specialist provided local resources but also made an appointment with a Mission United Navigator. Heart of Florida United Way’s Mission United Navigators assist veterans with navigating social and veteran services. The Mission United Navigator helped Natalie find affordable housing as well as helping pay for the moving costs. Natalie is staying in a hotel temporarily but will be moving into her own place next week! 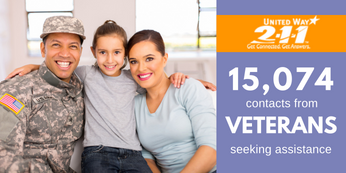 In the last year, 2-1-1 received 15,074 contacts from Veterans. Mission United is a collective effort that addresses the complicated and fragmented systems for veteran services currently in place. It is a community collaboration that serves as a central contact for veterans to access community support, ensuring that service members and their families are never more than two steps from the help they need. Mission United identifies gaps and creates systemic change in the areas of legal assistance, employment and education.